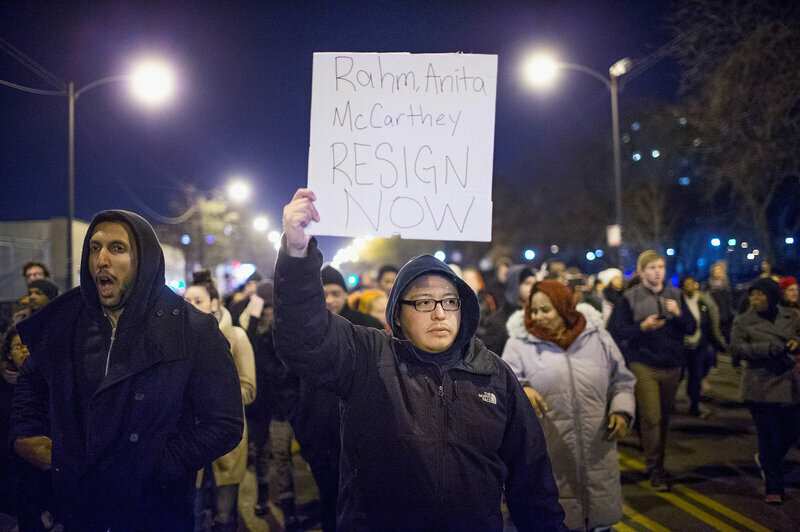 When Chicago Mayor Rahm Emanuel fired his police superintendent Tuesday, he acknowledged the problem that&apos;s been dogging law enforcement since the days of the first beat cops: How do we ensure that we are effectively policing the police? Of course, departments have internal affairs investigators, and some police also answer to civilian oversight boards. But since Ferguson, there&apos;s been a growing sense that the real conflict of interest is higher up — at the level of the local prosecutors. For prosecutors and grand juries, the decision to charge a cop is different from deciding whether to charge a civilian. There are good legal reasons for this — after all, cops are allowed to shoot people, if circumstances warrant. But there are also subtler, differences, says Jonathan Witmer-Rich, an associate professor at Cleveland State University&apos;s law school. "Prosecutors do not seem to approach police shooting cases the way that they approach ordinary shooting cases," he says. Witmer-Rich has been watching the controversial handling of the case of an officer who shot and killed 12-year-old Tamir Rice last year. He says prosecutors in cases like this one are in a tough spot. "It&apos;s very delicate for them politically," he says. "They have to work with the police, day in, day out. They&apos;re facing pressures about alienating people they work with regularly. And that makes it very hard for them politically." One idea for solving this is to bring in outsiders. This idea gained traction after the death of Eric Garner in New York City last year, for which no officer was charged. This summer Gov. Andrew Cuomo ordered the creation of a new unit of special prosecutors inside the attorney general&apos;s office. When in doubt, says Alvin Bragg, who heads the unit, district attorneys are supposed to call his crew to the scene of police shootings. Bragg cites an example in Suffolk County, Long Island. "The initial report was that the person was unarmed," Bragg says. "And then we got there and learned there was a knife, and then reviewed some video showing that the person who ultimately died was armed with a knife in the video. So, therefore the case fell outside of our jurisdiction." Since the special prosecutors step in only when the dead person was unarmed, they don&apos;t step in much — they&apos;ve taken just one case, so far. Still, cops don&apos;t like this system. "What my concern is, for those officers who shouldn&apos;t be indicted, then they&apos;ll be political pawns, and they will be indicted," says Michael Palladino, head of the NYPD detectives&apos; union. He says bringing in a special prosecutor also creates political pressures. "There is definitely going to be an expectation ... that an indictment is going to be returned," he says. The answer may lie with consistency: Bring in outsiders every time the police kill or seriously injure someone. That&apos;s what&apos;s done in many Canadian provinces. "We receive notice immediately and we&apos;re the ones that roll out and take over the scene," says Richard Rosenthal, head of a three-year-old entity called the Independent Investigations Office of British Columbia. "The police protect the outside of the scene. But we&apos;re in charge of the inside of the scene." "So we are the actual criminal investigators, but we&apos;re not police," he says. That philosophy runs so deep, the agency won&apos;t hire recently retired British Columbia police as investigators. Contrast that to the U.S., where police shootings are usually investigated by another law enforcement agency. Rosenthal saw this up close — he&apos;s an American, a former prosecutor from Los Angeles — and he says cops have a hard time investigating other cops. "It&apos;s very, very difficult, for you to tell somebody to investigate their peers," he says. "And the &apos;there but for the grace of God go I&apos; philosophy permeates through police investigations." It&apos;s true that regular prosecutors make the final call on charges. But there is less political pressure, because the investigations and reports always come from an independent entity. And, Rosenthal says, that&apos;s something even the police in British Columbia have come to appreciate.